This is one of my Venice Neighborhood Ball Parks: the transformation of a blighted site in Venice into beautiful, interesting, safe & enjoyable neighborhood space. For this site, owned by the adjacent church, the serene spiritual path fits conceptually and the in-ground form meets practical needs. Painting the church restored it's historic Craftsman style. 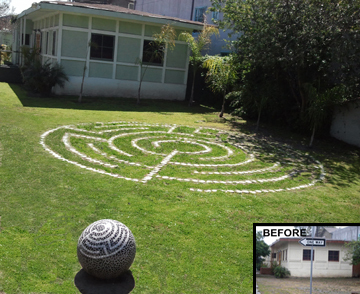 The Mosaic Ball is both sculptural seating and a neighborhood marker.